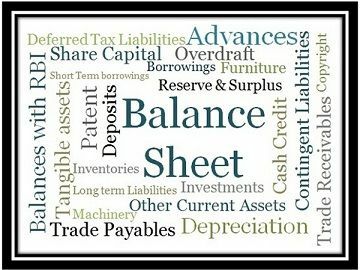 Balance Sheet, or otherwise called as Position statement, is an integral part of the financial statement which shows the statement of affairs of an entity, in terms of what the business owns and what it owes to the external parties and to the owners, on a particular date. Balance Sheet of a trading concern and that of a banking concern are prepared differently because the act which rules the two are different. So, there are different formats provided in advance for the preparation of Balance Sheet of a company and Bank. Moreover, these two also differ in terms of requirements. When one is working on Balance Sheet, he/she should be aware of the difference between Company Balance Sheet and Bank Balance Sheet. Basis of Preparation Balance Sheet is prepared as per Schedule VI of the Indian Companies Act, 2013. Balance Sheet is prepared as per Indian Banking Regulation Act, 1949. Balance Sheet is a statement that shows the current financial position of a company, i.e. the assets owned by the company and the liabilities owed to the company, along with its net worth at the end of the financial year. Now what we need to know is how it is prepared and what items are shown in it? A balance sheet is prepared as per the Schedule VI of the Indian Companies Act, 1956 in which Notes to the accounts are prepared for clear understanding. It is divided into two heads, (1) Equity & Liabilities and (2) Assets whose total amount needs to be identical. Given below is a hypothetical Balance Sheet of XYZ Ltd as on 31st March 2014. Share Capital – The funds raised by the company from the issue of shares, in consideration for cash or kind. Reserves & Surplus – At the end of every accounting year, a part of the profit is transferred to reserves for unforeseen future expenses or losses is known as reserves. The balance remained in the Income Statement after all appropriations and adjustments are known as surplus. Long Term Borrowings – Loans or Borrowings taken by the company which is to be paid after one year or 12 months is known as long-term borrowings. For example Debentures, Loans. Deferred tax liabilities – Tax liability of the company for the current accounting year. Other Long Term Liabilities – Financial obligations payable after one year like employee provident fund, workmen compensation fund, etc. Long term, provision – The Financial obligation of the company, payable after one year, which arises due to a past event. Short term Borrowings – Borrowings of the company, payable within one year. Trade Payable – Creditors and Bills Payable together known as trade payable. Tangible Assets – The fixed assets that can be seen or touched. For example – Machinery, Furniture, Land & Building, etc. Intangible Assets – The non-physical assets of the company, i.e. the assets that can neither be seen nor touched is known as Intangible Assets. For example – Patents, Copyright, Trademark, etc. Non – Current Investment – The investment whose value will be realised after a specified period (more than a year). Long Term Loans and Advances – Loans and Advances are given as a debt by the company for a long time. Trade Receivables – Debtors and Bills Receivable are together known as trade receivables. Cash & Cash Equivalents – The actual cash in the business is known as cash also termed as ready money. Cash equivalents are the assets which can be easily transferred into cash like commercial paper and marketable securities. Short Term Loans and Advances – Loans and Advances which are given as a debt by the company for a short period. The Balance Sheet of a Bank reflects its financial health. Liabilities shows the sources of funds raised, Assets accounts for the applications of the funds and net worth is the owner’s fund at a particular date, usually at the end of the financial year. Now, let’s talk about what’s new in the Balance Sheet of the Bank. We all know the simple and basic definition of Balance Sheet, here we are going to discuss how it is prepared and what are the major items shown in it. Balance Sheet of a bank is prepared according to the Banking Regulation Act, 1949 in which Schedules are prepared for its clear understanding. It is mainly divided into two broad heads (1) Capital and Liabilities (2) Assets whose amount must be same. Below is an imaginary Balance Sheet is given for ABC Bank as on 31st March 2014. Total Share Capital – The capital of the company in the form of shares is known as share capital. It comprises of both equity and preferred capital. Reserves – A percentage of profit is transferred to reserves every year, to meet out future contingencies. Deposits – Amount deposited by the customers in the bank, such as saving deposits, fixed deposits, recurring deposit. Borrowings – Amount borrowed by the bank from any bank or financial institution. Other Liabilities & Provisions – Financial obligation to be discharged by the bank. Cash & Balance with RBI – Amount of money maintained with the Reserve Bank of India. Balance with Bank, Money at call and short notice – Funds maintained with any commercial bank, which are for a very short period. Investment – Money invested by the bank as an investment within and outside India. Advances – Money lent in the form of the loan, such as cash credit, bill discounted and overdraft. Gross Block – It is the gross block of fixed asset, from which accumulated depreciation is deducted to arise at the netblock of the asset. Other Asset – It comprises of the accrued income, advance tax paid and miscellaneous income. Balance Sheet of a Company is prepared according to Schedule VI of the Indian Companies Act, 2013. Balance Sheet of a Bank is prepared according to the Indian Banking Regulation Act, 1949. Notes to Account are made in the Company Balance Sheet. Conversely, Schedules are made in the Bank Balance Sheet. Balance Sheet of a company is an important tool for the financial analysis of any concern. It shows the financial status of any company at a particular date. It helps the stakeholders to know about its liquidity, solvency, and performance. Besides this, the comparison can also be made in the past and present performance of the entity. Glad to hear that, the content helped you.